North America is blessed with some incredible geography and natural landscapes. From the Grand Canyon to Denali, there's a long list of iconic landmarks to be found all over the continent, with the five Great Lakes of North America ranking among the most impressive. Of the five Great Lakes, Lake Michigan is the only one to be situated entirely within the United States. It is the second largest of the lakes in terms of volume and the third largest in terms of surface area, bordering the states of Wisconsin, Michigan, Indiana, and Illinois. The lake has a shore length of around 1,400 miles in total, with more than 200 additional miles of shore on Lake Michigan's various islands, and this means that there a lot of great beaches to be found all around the lake. Lake Michigan is a hugely popular touristic location, attracting millions of visitors from all around the world on an annual basis for many different activities, and one of the most popular things for tourists to do at Lake Michigan is simply find a nice sandy spot on one of the beaches and admire the inspiring views all around them. Lake Michigan has earned the nickname 'Third Coast' of the United States for its long coastline and multitude of beaches. Beautiful soft sands, immense dunes, stunning views, and all kinds of wildlife can be enjoyed on Lake Michigan beaches. Many of the softest, sandiest beaches around Lake Michigan are located on the southern and eastern shores, while the northern and western parts of Lake Michigan's shoreline are dominated by rocky areas. So if you want to visit a Lake Michigan beach, it makes sense to stay around the south and eastern parts of the lake. 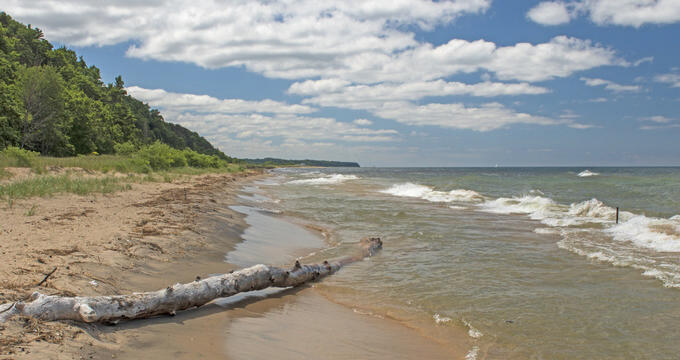 Here are some details on the top rated Lake Michigan beaches for you to enjoy. Ranked as one of the most popular beaches in all of North America and a definite must-visit location for anyone interested in checking out Lake Michigan, Oval Beach can be found in Saugatuck, MI. What makes Oval Beach so popular? Well, this Lake Michigan beach arguably offers the very best views of all. No matter which part of the beach you choose to visit, you'll be rewarded with sights and sounds that will blow you away, creating magical memories to last a lifetime. The waters here are very calm and welcoming and the sand is super soft. Some of the amenities you can find at this Lake Michigan beach include restrooms, concessions, picnic tables, BBQs, showers, and play areas. There's also a huge pier stretching out into the water offering special views of the nearby Kalamazoo River. Located right by Oval Beach in the Michigan city of Saugatuck, the Saugatuck Dunes State Park offers another of Lake Michigan's very best beaches. As the name suggests, there are some really impressive sand dunes at this Lake Michigan beach. It can be a lot of fun for beachgoers to explore the dunes and enjoy some incredible views from the top, with some of the dunes reaching heights of 200 feet in total. There's also a nice picnic area for guests to enjoy, and the state park is filled with scenic hiking trails too. Another great thing about Saugatuck Dunes Start Park is that the beach runs for over two miles, so even on busy days, you can always find a nice private spot. There are actually multiple beaches to be found in this extensive area, with some highlights being Cedar Point, Golden Township Park, and Little Sable Point Lighthouse Beach. Again, as the name suggests, the Silver Lake Sand Dunes Area is filled with some very impressive sand dunes to admire and explore. Off-road vehicle tours are especially popular around this area and there are actually some hidden little beach spots that can only really be accessed in ORVs. The beaches here border both Lake Michigan and Silver Lake, so you're getting twice as much water and fun in one great location, and there are hiking trails among the dunes as well. One of Chicago's best spots, this Lake Michigan beach is perfect for residents or visitors to the Windy City. Open every day, North Avenue Beach offers incredible views of the Chicago skyline on one side and the bold blue waters of Lake Michigan on the other. The great thing about this Lake Michigan beach is that it benefits from all the local amenities and eateries of Chicago, with plenty of good bars and restaurants just short walks away. The beach is a popular spot for games and activities like volleyball and jet skiing, and it can be a super spot to simply walk along and admire the views. Bike rentals can be found nearby, as well as kayaks, paddleboards, jet skis, wakeboards, and more. Located in South Haven, Michigan, South Beach Park is one of the most family-friendly locations around the Lake Michigan shoreline, with a lot of fun areas and activities for people of all ages to enjoy. There's a skate park for the teens and volleyball spots for all the family, as well as the local lighthouse which has been going since the late 19th century. Swimming at South Beach Park can be a lot of fun due to the calm, welcoming waters at this Lake Michigan beach, and the sand is soft and comfortable too, perfect for people who just want to lie back, relax, and let the day pass by.